On March 3, 1958, a endearing passenger car with a distinctive individuality came on the market: the Subaru 360, the first of Subaru cars. At that time, Japanese automobile manufacturers were working on developing small cars according to a plan calling for the production of a "people's car" as advocated by Japan's Ministry of International Trade and Industry. 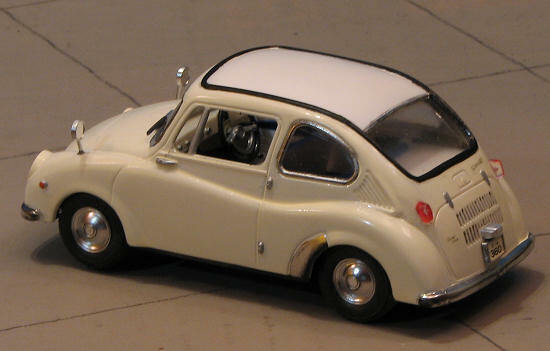 The Subaru 360 was developed in line with this concept. In those days, passenger cars were too expensive to be within the reach of most people. Building a small, affordable car that could perform well proved to be technologically tough, and many manufacturers were reluctant to tackle the problem. However, with its roots in aircraft manufacturing, Subaru took up the challenge backed by its pride and prodigious technological strength. 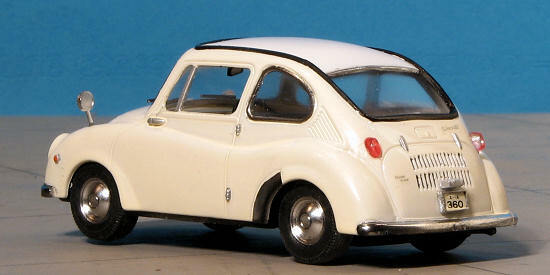 It beat the other manufacturers in developing a four-passenger, four-wheel minicar, the Subaru 360, which became a milestone in the history of Japan's automobile industry. Because of its ladybug shape, the Subaru 360 was affectionately referred to as the Ladybird. 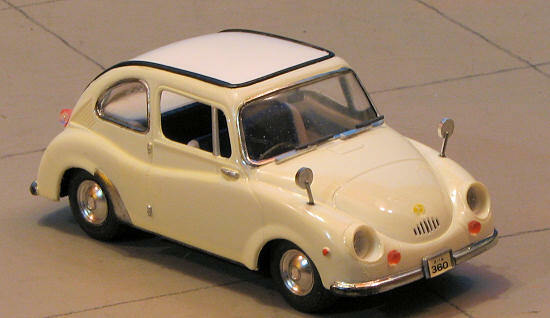 For 11 years after its debut, the Subaru 360 enjoyed tremendous popularity. It finally went out of production in May 1970. I should also mention that if you were anything close to 6 foot tall, you could forget about getting into one of these things. They were underpowered to the max, especially with more than a driver aboard. I have seen carnival operators set up an off road crash-em course with these cars minus the glass. Despite looking like hell, they rarely went fast enough in this situation to hurt anyone. Later, other car companies in Japan picked up on the trend and during my military career I owned or part owned a Toyota 600cc minicar and a Honda 360cc minicar. Both required the front seat to be all the way against the back for me to sit in it. Both had a four speed column shift and right hand drive. This is #4 in the 1/32 'Owner's Club' series by Arii. I'm not sure if this is a series that LS also had, but I can imagine that it might well be. The kit itself is quite basic and a curbside. There is one white sprue, one clear, the body and four rubber tires. The mold seam on the body at times borders on flash and the same can be said of the main sprue, though generally the parts are quite clean. The molding is in good shape and devoid of sink areas and visible ejector pin marks. The Spartan interior consists of little more that seats, shifter, instrument panel, steering wheel and door inserts. No foot pedals. Exterior bits consist of lights, wipers, side view mirrors and license plates. The clear parts are quite distorted so it is a good thing there are no door windows so at least you can see the interior. A small decal sheet includes plates, instruments, and some trim. Instructions provide well done drawings and colors in Gunze paints. Of course, nearly everything is written in Japanese. Step one in construction is to remove all the body mold seams. This will require both sanding materials and files to get into the various nooks and crannies. Once that was done, the roof insert section was painted gloss white, using Testors enamels. The seats and inner door panels were also painted this color. 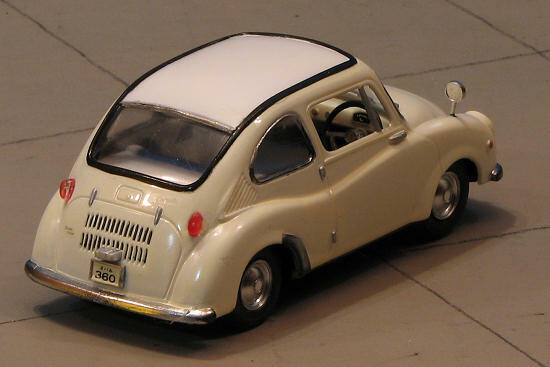 Back at the body, the roof was masked off and the rest of the car was painted with Tamiya Racing White, a sort of ivory shaded paint. Looks white until you remove the masking and compare it with the roof. Well, when that had dried, the various seals, bumpers, and window frames were painted black. I also painted the chassis and axles this color. The body painting required a TON of careful masking. The black for the roof seal was then masked and the rest of the visible parts were given two coats of Alclad II Chrome. I also painted several other smaller bits black and then chrome (such as the mirrors and the wheels) at the same time. Meanwhile, the door panels and seats has parts masked off and the rest was painted Tamiya X-4 blue. Typical car where you paint the heck out of everything first before you start into the standard construction. With everything having several days to cure, I pulled off the masking to see how much I needed to touch up. More than I'd like and in the future, I think I'll stick to Bare Metal Foil for most of my metal work. Some careful retouching and scraping got things looking better. Meanwhile, I painted the dash with the exterior color as I'd forgotten to do so earlier. When dry, I applied decals to the body and the lone instrument decal to the dash. While this was going on, I sanded the seams from the tires and slid them onto the wheels. There is an insert that goes under the chassis for the rear axle. This was too small in diameter so I had to ream it out in order to get the plastic axles to fit. Bit more painting and the axles were slid into place with the wheels glued on. I then cemented in the seats, gluing the shift levers in place at this time as well. The side panels had some detail painting done on the handles and were glued onto the chassis. The steering wheel has quite a bit of flash on it and so after cleaning that up and painting it, it was attached to the dash section. Back at the body the rear view mirror was glued to the windshield section and then glued into the body. I then did some clean up and repainting on the fender mirrors and the wipers and the license plate holders. These were then attached. The last things were the turn signals, tail lights, and head light lenses. These were painted in the appropriate colors, the chassis snapped into the body and I was done. This is the second of these kits I've built and I've enjoyed both of them. They are not fussy builds, the end result looks good and I can stick them as static models on my slot car layout! I'd have to mark this one as a week special as that is about how long it took to build. Much of your time will be spent painting and cleaning up parts, but you know, that seems to be the way it is with car kits of all types. If you can find any of these kits, I really think you should give one a go. Thanks to me and my less bulging change purse for this one.